Jigtech lever handles are quick to install, easy to use and ideal for internal doors. For rooms that require more privacy, such as bathrooms, these lever handles can be paired with additional Jigtech tubular latches and privacy roses. 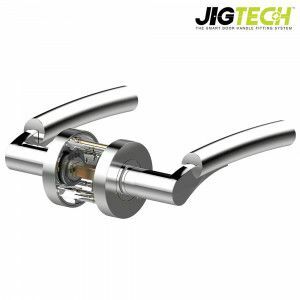 To install these lever handles, you will require a Jigtech system – our Jigtech installation kit comes complete with all the necessary accessories to install any Jigtech handles, Jigtech thumbturn locks or Jigtech latches in under five minutes. Alternatively, we stock the HOPPE Quick-Fit Plus system. This door handle mechanism is also easy to assemble in a short period of time and it doesn’t require screws, making it ideal for commercial situations. A dummy lever can be supplied to be used during painting. Amongst this range, we store straight handles, such as the Quick Fit Plus Amsterdam Satin Stainless Steel Lever, or curved door handles, such as the Quick Fit Plus Paris Satin Stainless Steel Lever. We also supply a wide selection of standard door handles to meet the needs of any property owner, from lever handles and door knobs to pull handles and cabinet handles. If you require a simple door handle, we recommend our lever handles on rose and pull handles. In case you are looking for more stylish options, we recommend our selection of door knobs, from modern and simple door knobs to ornate and antique door knobs. Our lever handles on backplates come in a variety of styles, from contemporary Euro profile lever on backplate to handmade lever lock handles.